A 1995 meeting in Tokyo between Korean and Japanese proponents of the art of free jazz furnishes another entry in the Chap Chap series of improvised encounters issued by the Lithuanian NoBusiness imprint. 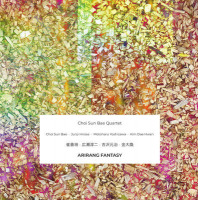 From Korea, Arirang Fantasy introduces trumpeter Choi Sun Bae, who also features alongside Japanese trumpeter Itaru Oki on Kami Fusen (NoBusiness, 2017), and celebrated percussionist Kim Dae Hwan, who was also a famous calligraphist, and performed with Butch Morris. Completing the group are the Japanese bassist Motoharu Yoshizawa, who played with the likes of Evan Parker, Steve Lacy and Derek Bailey, and also featured in a series of duets with Barre Phillips on Oh My, Those Boys (NoBusiness, 2018) , and saxophonist Junji Hirose. Although billed as a quartet, they actually only all play together on the final cut which is preceded by two duos, a solo and a trio. Both the trumpeter and saxophonist make extensive and musical use of extended techniques such as circular breathing. When not operating at the spluttery extremes, Bae inclines towards downbeat lyricism, and it's the contrast this offers when compared to his colleagues' more adventurous textures which gives the date part of its distinctive character. That can be heard immediately on the opening cut in a conversational duet with the woody sound of Yoshizawa's vertical electric bass. Although it's unclear if all the tracks are improvisations or whether there are some compositions, they are certainly on the same wavelength, particularly when Yoshizawa's hard-edged arco shadows Bae's plaintive trumpet. It can also be heard on "Remember Bird" on which Hirose on tenor enters alongside Bae for a dirge-like canon in which they intertwine alluringly around a beautiful, regretful melody. But after five minutes they abruptly switch to a fractious exchange of staccato squawking. Then as Hirose continues his yelping tirade, Bae lays down a long unbroken folky line which the reedman eventually doubles. Structure on-the-fly or predetermined? Whatever it results in a wonderful listening experience. Both bassist and reedman join Bae on "Korea Fantasy" which unfolds into unruly horn dialogue with creaking arco bass. Again the structure is both novel and pleasing. As Yoshizawa's subterranean groans persist, the horns keep up an unbroken hum from which one or the other periodically erupts. Hwan appears for the first time on the solo "The Stream Of Time." A photo in the CD booklet shows him standing behind a personalized percussion set up which partly explains the idiosyncratic linear rather than polyrhythmic flavor he brings to the date. His thudding drums take on a ceremonial air, similar to traditional Japanese taiko drumming. It's not until the title cut that the foursome unites for a piece notable for its sudden shifts in dynamics. In the midst of bass modulated with electronics, darting and droning saxophone and a thumping beat which doesn't swing, Bae plays what might be mistaken for a gospel air. Saxophone and trumpet take turns to loosely maintain that mournful undercurrent until the interchange peaks, before subsiding to ethereal gasps. Non-Western elements combine with more recognizable aspects of the free jazz tradition to create this unusual and engaging session. Track Listing: Blue Sky; Remember Bird; The Stream Of Time; Korea Fantasy; Arirang Fantasy. Personnel: Choi Sun Bae: trumpet; Junji Hirose: tenor and soprano saxophones; Motoharu Yoshizawa: electric vertical five string bass; Kim Dae Hwan: percussion.